Conducting interviews in a video conference call isn’t difficult, especially when you have the right conferencing tools at your disposal. If you work in human resources, purchasing, a law office, casting, or any other field for that matter, chances are you must meet with other people on a regular basis. From job interviews to auditions and everything in between, video conferencing can fill in the gaps when meeting in person isn’t practical. Use the tips below to conduct face-to-face interviews via video conferencing. • Choose a video conferencing system that’s easy for all participants — Web-based video conferencing is a great option that allows attendees to sign in using a common web browser or a smartphone. There’s no special software to install and configure, reducing friction and facilitating your face-to-face collaboration. • Prepare your materials — Not only are web video conferences an excellent way to interact in real time, complete with audio and video, they make it possible to exchange information such as files, presentations, or even YouTube videos. For example, when interviewing a job candidate, you may want to go over the job description or play a prerecorded video tour of your office. Place these files in a folder on your desktop for easy access during the interview. • Clear your virtual desktop — Screen sharing is a desirable feature of video conference software, but you’ll want to be sure to do some basic housekeeping before your video interview. For instance, if you have QuickBooks open during your meeting and then share your screen, other participants may be able to see confidential information. Likewise, you’ll want to disable email and SMS notifications and on-screen reminders. Finally, make sure your desktop wallpaper is professional. • Clear your physical desktop (and on-camera surroundings) — Turn on your webcam before the meeting and make sure that you’re happy with the background. Is it clutter-free? Neutral? Once the visuals have been addressed, consider potential sources of audible interference such as ringing telephones, an open window, office chatter, or a barking dog. • Invite participants — Holding interviews over a video conference makes it possible to include people who might not otherwise be able to attend due to geographic distances. For example, if the purchasing manager needs to be involved but is on a business trip in another state or country, holding a video conference allows everyone to gather virtually to conduct the interview. • Conduct the interview — The basics of interviewing remain the same as if you were in the same room, so follow established norms. 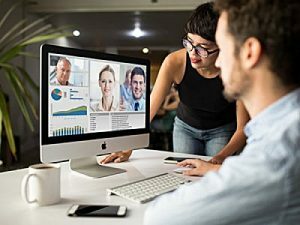 From a technological standpoint, you may want to take advantage of a few features unique to video conferencing such as recording, collaborative notes, chat boxes, and screen sharing. • Follow up steps — After the video conference ends and depending on the features you used, you may have some additional resources to aid in decision-making. For example, if you recorded the meeting and would like a second opinion from a colleague, you could share the recording. Similarly, if you used the collaborative notes feature, you may want to go in afterwards to fine-tune your notes, view other collaborators’ notes, or add additional information to them. Reviewing the chat transcript is also helpful. Conducting interviews in a video conference call isn’t difficult, especially when you have the right conferencing tools at your disposal. Sign up for a free trial and experience the benefits of video conferencing firsthand.